It's not like we needed any more proof that we live in car-centric cities. When you start scratching just a little below the surface, however, you start to discover that we are not so much citizens in cities but rather a flock of reluctant characters in The Matrix. You discover that we live in cities that are controlled by bizarre and often outdated mathematical theories, models and engineering “solutions” that continue to be used despite the fact that they are of little use to modern cities. One of them is called The 85th Percentile. It's a method that cities all over the planet use to determine speed limits. It's the standard. Nobody questions it. Certainly not the engineers and planners who, for decades, have been served it up and who have swallowed it whole during their studies. Which reminds us of the old traffic engineer joke: Why did the engineer cross the road? Because that's what they did last year. 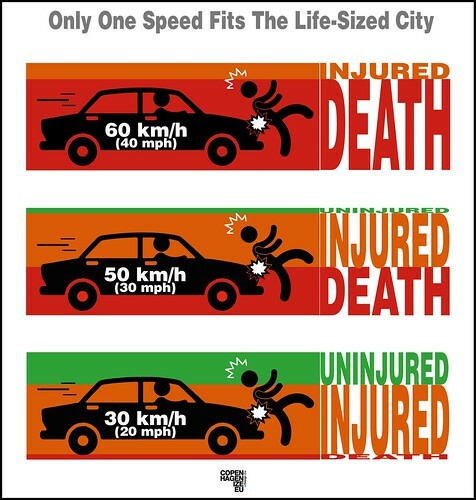 The concept is rather simple: the speed limit of a road is set by determining the speed of 85% of cars that go down it. In other words, the speed limit is solely set by the speed of drivers, and this is the basic rule that determines traffic speeds worldwide. Including the street outside your home. It can, of course, be revised but that rarely happens. The engineers will just shrug and say that The 85th Percentile method is the only method and can't be changed. The numbers don't lie. The problem is that human beings are not numbers. • A speed at or below which 85 % of people drive at any given location under good weather and visibility conditions may be considered as the maximum safe speed for that location». If they're assuming that the large majority of drivers are reasonable and prudent, then what about the rest of the drivers? I guess that's what living in The Matrix is like: assume that everything is going to be fine by handing over complete power of our streets to motorists. AND mixing anthropological assumptions with pseudo-science. Not generally regarded as a good idea. Imagine a street where the average speed is 50 km/h. If the speed is reduced by 5 km/h then, according to this archaic model, the drivers are allegedly exposed to a higher risk. What is most shocking is that this entire concept completely ignores pedestrians and cyclists. 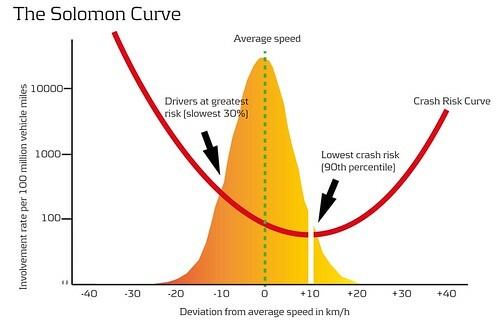 Another horrific conclusion from this graph is that when you increase the speed, the crash risk is alleged to be less than for slow speeds. All of this seems suspiciously like an argument to build more highways and freeways – because “with more speed comes more security”, as they (once) said. The graph is still touted as the “latest research” is called The Solomon Curve. We were looking into it here at the office and we all guessed how old it was. None of us were close – guessing between 15 and 30 years old. In reality, it is based on a study by David Solomon back in 1964. It is still wholly endorsed by the U.S. Department of Commerce and the Bureau of Public Roads, which was administrated - at the time of the study - by Rex Whitton. 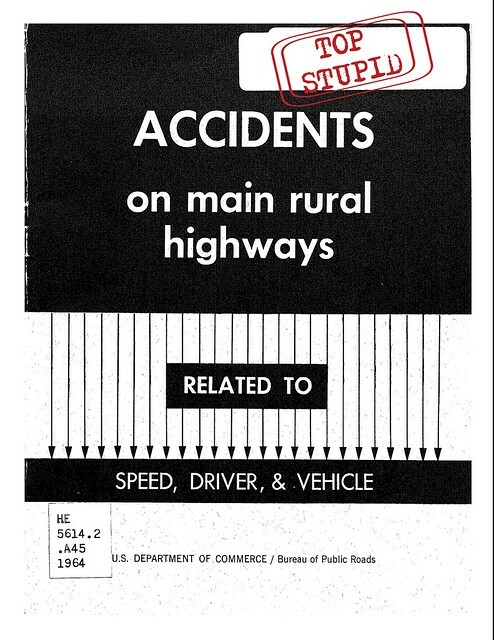 He was also – surprise, surprise – a Federal Highway Administrator. Okay, we're not surprised. Basically, a study from 1964 remains the main argument to build more highways and freeways with faster speeds where the ends justify the means. Even if the means ignore vulnerable groups such as pedestrians and cyclists. Even if the study is now also used to serve the automobile in densely-populated urban areas, far from any freeway. The Institute of Traffic Engineers wrote: “The 85th Percentile is how drivers vote with their feet”. They forgot to mention that, when it comes to establishing speed limits in cities, pedestrians and cyclists are excluded from this election. They don't even get the chance to go to the polls. All this right now in 2012. In your street. With your tax money. 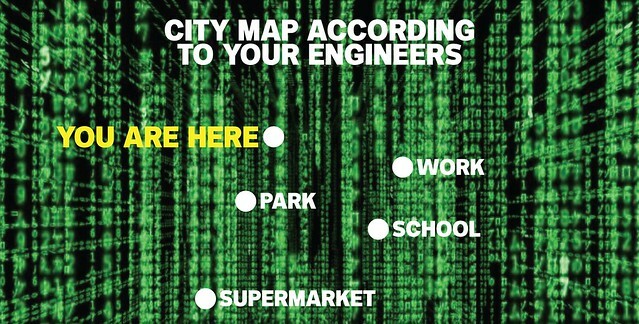 Welcome to The Matrix. Please don't try to resist.